A multivariable model based predictive control (MPC) was implemented at the FCCU "A" in YPF S.A. Refinería La Plata. There are three MPC controllers installed: one covering the reactor-regenerator-main fractionator, other controlling the gas con centration plant ant the third controlling an isolated depropanizer column. The paper describes the implementation of the project, the controller structure and the main results obtained from the MPC. Multivariable, model-based predictive controllers (MPC) implemented in an industrial plant not only sup presses process perturbations but also optimizes its economical performance. The benefits usually arise from higher throughputs, better utility allocation and best yield in higher value products. Typical payback is measured in months instead of years. To identify the optimum operating point, move the plant operation to it and maintain in time the operating condition is not an easy task. Although, it is the basic behavior one expects from a multivariable model based controller. A linear programming algorithm embedded in the controller software performs the calculation of the optimum. The Linear Program (LP) calculates the target at which the plant will be (or continue to be) operating in the near future. Because of the inherent nature of the LP problem, the solution obtained is at a number of restrictions, equal to the number of decision (degree of freedom) variables. The same LP methodology is used to calculate the controller movements in order to achieve the targets (ie, set-points) with the minimum violation (squared error) with respect to them. The general theory underlying on a linear MPC implementation is given. In the middle of 1994, YPF S.A. La Plata Refinery began an MPC advanced control technology application pro gram involving several units. At the present there has been commissioned the following controllers Coker B a Vacuum B, FCC A and FCC Gascon A. Advanced control projects for several other units are being commissioned now or are near to be started. The first step was the old pneumatic instrumentation re vamp or the DCS regulatory system tuning. The experience indicates the one-by-one replacement of old pneumatic instrumentation by modern electronic devices do not pro duce substantial economic benefits. Only the advanced control strategies mounted over the basic PID electronic control layer achieve good economic profits. The Fluidized Cracking Catalytic Unit (FCCU) is one of the most important plants of a modern high-conversion refinery. It produces the bulk of high quality naphtha blending components from low quality feeds. Even small improvements in the operation of such units impact on the overall refinery economics. Recently, YPF S.A. La Plata refinery has completed an MPC advanced control project on its FCC unit "A". Three MPC were installed in the plant including: reactor regenerator main fractionator, gas concentration plant (absorber, stripper and debutanizer columns) and the depropanizer column itself. 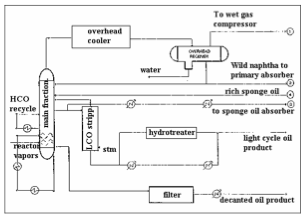 This work describes the overall project methodology, from the preliminary design to the MPC commissioning, showing some of the results obtained with the controller. In modern industry there exists a universal trend to wards better quality products, more efficient energy usage, higher productivity and serious ambient care have imposed high strengths over the plants. 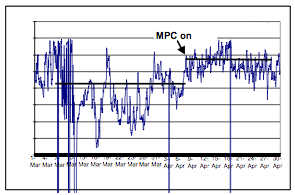 Industry response to those challenges arises in the application of a modern control technique usually recognized as Multivariable Predictive Control (MPC). In this section, a global vision of the practice and theory of MPC will be given. The discussion of some basic principles, relevant aspects of its theory and several practical implementation comments will be assessed. Calculate the optimum operating condition, taking care of the process constraints. Calculate the better corrective control action to maintain the process variables as near to the optimum as possible. 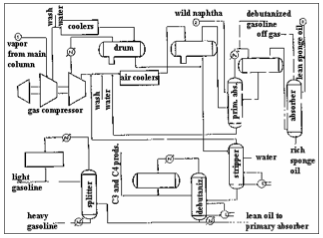 The general MPC implementations are so popular that, in accordance to a recent revision study (García et al., 1989; Yamamoto et al., 1991) became as the advanced control methodology of wider use in industrial applications of chemical, petrochemical and refining industry. Before to enter in the description of MPC practice and theory, its actual success will be shown from the perspective of the modern processing industry. In many cases, the product key quality variable is not available to be measured on line and even not the basic variables are available to sufficient enough quick measurements. Additionally, when the same operating unit is employed to produce several different grades of the same basic product, the plant will suffer frequent transitions or startups and shutdowns. 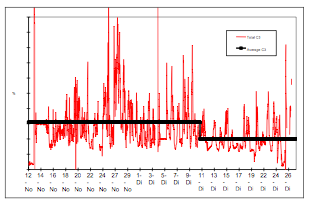 Dead times caused by transportation delays through piping, large delay among the take from samples and the obtainment of the results of the analysis, slow large equipment responses with high holdups, etc. MPC technology is able to meet many of those requirements. Let's the vector b = (β , β , ...,β ,) T representing the 12n unitary step perturbation response for a given process, as shown in Figure 1.
where k is used to indicate the time origin of the prediction vector sequence and the super index ° is used to note a conditional prediction (with no control action being taken further). If k = 0 it means essentially an initial condition predicted for the plant. It can be obtained recursive sequences for k > 0 using the (k-1) available predictions. Note the vector notation for y∧°(k) (and also for y(k + 1) and Δu(k), below) is special, denoting a scalar given at various steps, more than an output vector at a given step, as should be the more usual meaning. is the non-parametric coefficients embedding the dy-namics information of the system. Note the matrix is formed by m columns of the step response function coefficients, conveniently displaced downwards, Δu(k) represents the m-dimensional control movements vector and w(k+1) is the collective non modeled disturbances effect. Equation 1 is the core of MPC technology, from where it can be calculated the optimal control action, Δu(k), in order to obtain a given control performance for the plant. 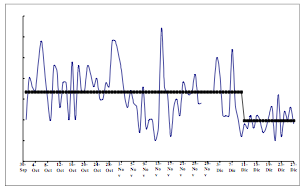 Optimizing Program (Lineal or Quadratic) for the managing of restrictions and economic Optimization. Calculation Routine for optimal control movements. 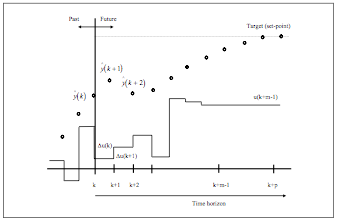 Counting on the complete dynamic model of the process, obtained with the proper multivariable identification software multivariable (generally provided included in the commercial software package), the controller uses all the relevant information of the past to predict the behavior of all the controlled variables from the current moment until its future steady state. This time is usually known as the process time horizon and depends on each plant in particular. The optimizing routine (either LP or SQP) uses the forecasted unforced behavior and the costs of the manipulated variables to find the optimum operating point of the process (economic optimum). The optimizer identifies the optimum operating point taking into account the restrictions of the process (e.g., maximum piping temperatures, percentage of O2 in combustion gas, limit quality in the products, maximum equipment capacity, etc. ), during each control cycle. The optimizer assures the process will be continually carried toward the operation that more benefits provides. The objective function for the optimizing program is calculated with the most recent prices of the product, feed stock and services cost, during each control cycle. The operating restrictions are included in the controller as de pendent variables (controlled) with high and low bound limits. The optimizer handles non-squared control problems (e.g., different number of controlled and manipulated variables) easily. Depending on the solving strategy to be used, the solution will eventually reach a number of restrictions. LP solvers, inherent to its nature, will find a solution with the number of active restrictions equal to the number of decision (ie, manipulated) variables. QP solvers can find the optimum operating point inside the operating region, not necessarily over the restrictions. The dynamical controller provides optimum control of the process. It calculates a certain number of future movements for each manipulated variable over the time horizon. Depending on the MPC technology implementation, several tuning factors are required to be determined. Older technologies use factors such as "move suppression" and "equal concern" as the tuning parameters. The first one generates a compromise between the movement quantity in the manipulated variables (for example: the aggressiveness in the controller) and the control speed over the dependent variables. The second prioritize one controlled variable over the rest, given them more controller "concern". Newest technologies use only one tuning parameter, the "performance ratio", which combines the effect of the old technologies tuning factors. This approach is more intuitive than the traditional approach of defining multiple weighting factors on each controlled and manipulated variable, which have no obvious meaning. This improvement alone can reduce controller commissioning time by days. Irrespective to the particular process being controlled, an MPC project consists in the same basic stages. The following discussion describes the MPC project carried out on the Catalytic Cracking Unit "A" of YPF S.A. La Plata Re finery. The project involved the overall unit, including its gas concentration plant. 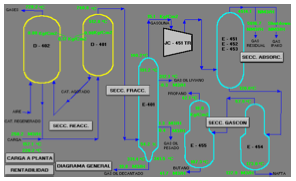 Figures 3, 6 and 9 shows general schematics of a typical FCC unit and is a screen taken from the overall refinery Plant Information (PI) system. During the initial phase of the project, the design of the controller was agreed with the YPF technical and operating staff. This previous review assured that the recommended structure of the MPC (manipulated variables selection, feed-forward and controlled variables) includes all the process constraints and the relevant operating points. During the other stages, smaller changes to this design were made in base to the information acquired during the pre test and test stages. A pre test of the regulatory system is carried out be fore the test. This pre-test consists "to move" each manipulated variable and to monitor the response of the basic regulatory control system. This stage provided information on the time to steady state of the process, the tuning of the existing controls, the "size" of the movements to be required during the test to obtain information and the quality of the signals originated in the control system. During the pre-test, the plant was disturbed during sufficient time to permit the identification of the process making use of the standard identification tools. It was developed a data acquisition system for all the process variables, sampled at a one-minute period during both the pre-test and plant test. At the end of the pre-test stage, a detailed report of the deficiencies found in the instrumentation and the recommendations of some additional measures to install and control strategies to modify was written. Once the instrumentation problems were corrected, the final test over the plant was carried out. The test of the process was carried out during several weeks, 24 hours a day, with control engineers monitoring the unit during the complete period. The process test implied to step each manipulated variable of the FCC unit approximately fifteen times and to gather the information for practically all-relevant measurement in the plant. To maintain an acceptable control performance in the unit, the operator modified the selection of the independent variable disturbed at its discretion. The only restrictions maintained was the structure of the regulatory control throughout and movements in each independent variable not related with each other. The operator decided also the size and direction of any movement in the independent variables during the test phase. The model developed after the identification of the test data was used to perform off-line simulations and tuning of the overall controllers. The tuning process was, essentially, an iterative, time consuming task looking for the best "equal concern" and "move suppression" factors arrangement for the overall controller performance. Once the model was tuned off-line, the on-line control program was generated and installed in the process control computer. The first commissioning task was to install the MPC executable code on the process control computer linked to the DCS through the proprietary Application Program Inter faces (APIs). The controllers were first operated in parallel with the plant, without the capacity to send actions to the process. Operating in this way, the MPC controller reads the values of the dependent and independent variables and calculates the future predicted behavior for the controlled variables, without doing movements on the process. This forecast was compared with the current changes in the plant, and the difference was reported as "prediction errors". In this way, the dynamic model was verified before the controller was turned on. Once the controller was verified, it was putted to work in closed loop. During 24 hours a day, technical engineering personnel worked in this stage in close contact with the plant operator. It was evaluated the performance of the controller in line and there were carried out some smaller modification in the tuning factors. 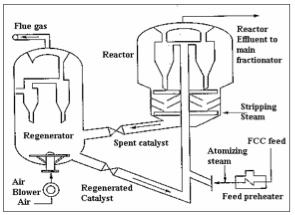 The reactor regenerator main fractionator MPC produces very good results in both plant stability and process improvements. Figure 5 shows how the controller permits a lower dense phase temperature, improving catalyst circulation with better yields. The exact evaluation of the economic benefit must be done with a rigorous reactor kinetic model and taking into account how the overall refinery operation is impacted. When air compressor capacity becomes the active restriction, changes in ambient temperature between day and night are used by the MPC to push more feed thorough the plant. Figure 7 shows both, FCC unit feed and cooling water temperature. 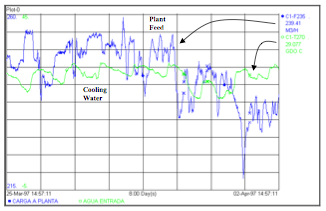 Note how the controller introduced more feed to the plant when the temperature is lower. On the main fractionator tower, the naphtha end point is an important control variable. It can be seen in Fig. 8 how the controller increased the naphtha end point and stabilized its control. The gas concentration plant and the depropanizer column gave also good results both in process stabilization and economic benefits. Figure 10 shows the propane / propylene content reduction in the off-gas, allowing more propane / propylene valuable products to be obtained. In Fig. 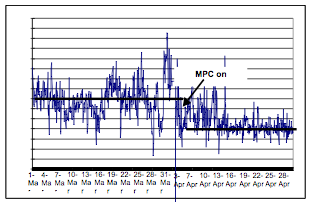 11, the better (lower) naphtha vapor pressures obtained with the MPC are shown. This impacts the refinery naphtha pool, allowing better usage of cheaper components for final gasoline blends. The MPC technology has proven to be a valuable tool to obtain economic benefits from the FCC plant. There exist a promissory horizon for this technology in the hydrocarbon processing and refining industry.